Although our Country is blessed with abundance of water, many villages and towns suffer even in getting drinking water. There is Flood on one area and Drought on the another area causing heavy damage. Due to drought, farmers go to the extreme step of committing suicide. Power Shortage and Unemployment are major problems in India. 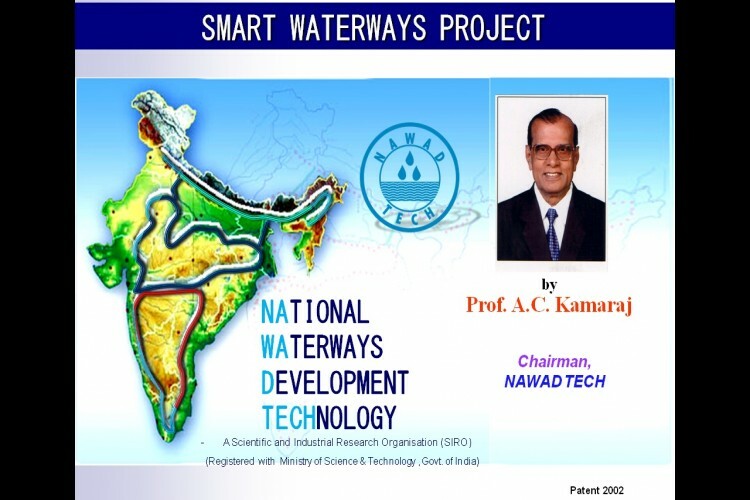 To overcome these problems, Er.A.C.Kamaraj with his team of over hundred top experts spread all over the Country & abroad formulated an unique & acceptable proposal called Smart Waterways / Ganga-Kumari National Waterways Project (NWP) for Networking of Rivers. This project can provide drinking water to more than 75% of the Indian population, irrigate 150 million acres of land and generate 60000 MW of environment friendly hydro power besides generating 200 million jobs in different field. Flood and drought are eliminated from the country using the same principle. In addition there is 15000 Km of Smart inland navigation operational around the year. There are many more indirect benefits like forestation, tourism, pisciculture etc. The funds raised will be utilized to study the proposal and bring out more detail and also to establish an advanced Research centre which is a must for this project. We have 80G tax exemption for donations. NAWAD TECH is a not-for-profit organization registered under section 25 of companies act dedicated to networking of rivers delivering benefits to public. Details of Chairman, Directors and Experts and their qualification are furnished separately. When Shri Suresh Prabhu was the Chairman of Task Force for Inter Linking of Rivers he formed an Independent Group of Experts to assess the best alternative to ILR proposal. Among 21 proposals received ours was declared as the best. States in India like Andhra, Kerala, Telangana, and Tamilnadu have accepted our proposal, because it is a win – win situation since every State gains and no state is a loser. Dr.A.P.J.Abdul Kalam was staunch supporter of waterways Project and he himself presented the project to many State Government. The present Government in Tamilnadu has announced in their Election Manifesto to take up “Tamilnadu Smart Waterways Project” (TSWP) given by us. Bihar Government has also accepted our proposal for their State and recommended to the National Planning Commission. We also hope to get approval for our projects in Andhra, Karnataka etc, shortly. Former Chief Engineer, PWD, Tamilnadu. Hon’ble Minister of State for Road Transport, Highways and Shipping Shri.Pon.Radha Krishnan visited our Smart Waterways Working Model at Madurai. Your share could be as good as a donation for NAWAD TECH! Not everyone can afford to take care of their loved ones. NAWAD TECH's life can only be saved by donations made by kind people like you.